I was very surprised with this show as I was expecting this to be a generic kids show based on a series of toys aimed for little girls like Strawberry Shortcake, Bratz, Monster High and the hundreds upon hundreds of Barbie films, instead I got a show that ranks on the great side of televisions shows based on toys like He-Man, Care Bears, Transformers and G.I. Joe. While this is meant for children you will find that you can find something for everyone in this show whether it's the humor, songs, background gags, style, ETC, it defiantly aims to be an all-round family show over a straight up girls show. I have a small problem with the first two episodes as we have a huge build-up to the main cast being legendary heroes but only to forget all about that not long after and I have to take away some points for that for being inconsistent. This could also be like that due to it being a pilot episode but that's really no excuse to not use it again. 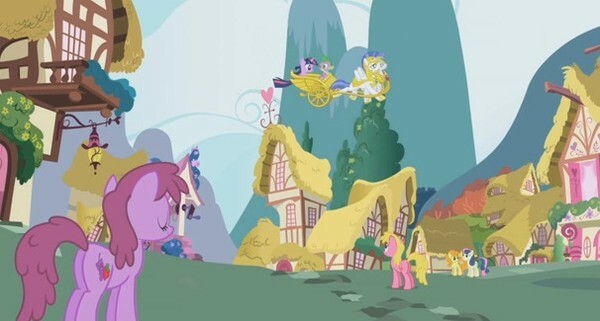 Other than those episodes the show is very episodic for the most part but you will occasionally see episodes continue on with a running theme (the Cutie Mark Crusaders for example). Characters themselves are really well written with a ton of charm and personality. 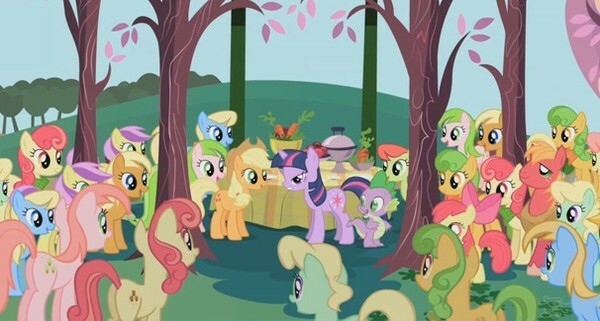 My particular favorite characters (a bit embarrassing to admit this out in the open) are Applejack because of her accent and the way she reacts to the other characters and Spike due to somewhat sharing the same situation as him by being bossed around to by a group of girls (like how I get bossed around by my little sisters who force me to watch this show every time it pops up on television). 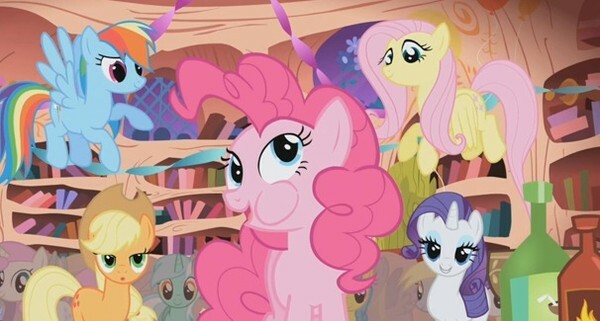 One thing I really enjoy about this show is that unlike the rest of the adaptions of My Little Pony (my little sisters have forced me to watch some of the other series as well) is that they really expanded the universe to have more than just the main gang of ponies. You will see big ones, little ones, male ones and even different breeds like Zebras. I like this as it adds some extra depth and gets rid of the standard format where they have a bunch of *insert thing here* with a small group of human kids which always makes shows feel a little awkward when they mix human children into things (a lot of shows suffer from this). Artwork is very crisp and clear with a very nice array of bright colors. This show also has a good use of shades that can really change the atmosphere and tone of the show ring in an instance going from bright and sunny to grim and wet. Animation is pretty smooth but you do get the rare awkwardly done animation that will make you go "hmm". 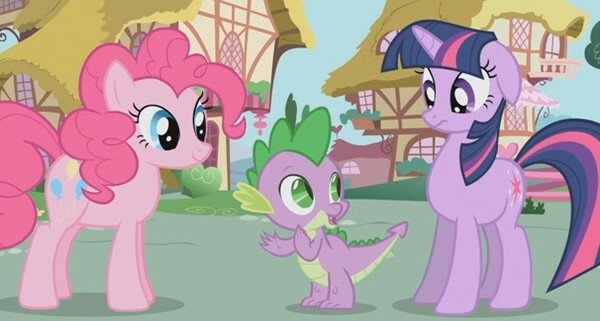 The English dub is very good with voices that suit every pony (and dragons) perfectly. There is also quite a nice variety of different voices and accents that helps make the show feel even more expansive. Soundtrack has a real catchy sound with some really well done musical numbers that will give you a sugar rush like burst of energy. I also have to refrain myself from singing some songs in public but it's really hard due to how catchy they get (and to avoid getting beat up in public). There are some special features although there isn't many (saying some is also stretching it). You have a sing-a-long music video of the full theme song that's bound to drive parents crazy from their kids playing it all the time. 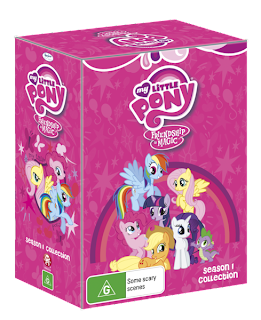 This set also comes with a real neat bumper sticker that says "honk if you love ponies" and it has Rainbow Dash right next to it which is very appropriate if you ask me. 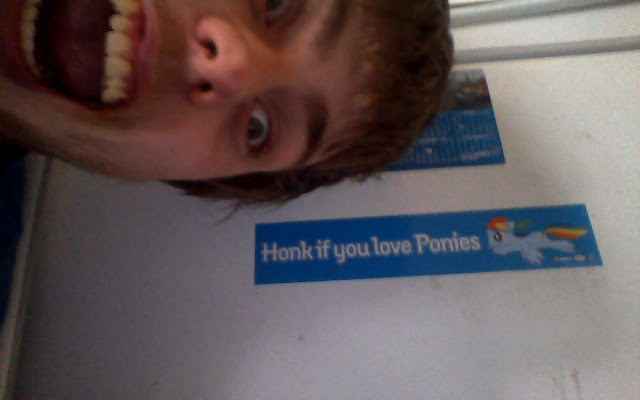 I have this baby on my fridge as you can see in this photo (see below). Can you spot the pony and the jackass in this photo? Overall I quite enjoyed this show and it will defiantly be something that you and your kids (doesn't necessary have to be your own kids) will enjoy. This show also takes me back to the day where I'd get up at the crack of dawn on Saturdays to watch some cartoons (I turned it off when Saved By The Bell popped on). While there is a lot of crap these days I'm glad that kids have a show like this and other certain shows that I won't mention due to reviewing them in the future (that's called a teaser children, tee hee!). Great television recommended for all. Oh, Retro Kaiser.................what would Jim Ross say? Ladies and gentlemen I'm afraid to inform you that we have a tragedy. That was an interesting read. As someone who geninely enjoys good art and animation, while the art looks very simple and lacking in detail, it does look bright and colorful and the clips of this show I've seen have had some rather impressive animation. 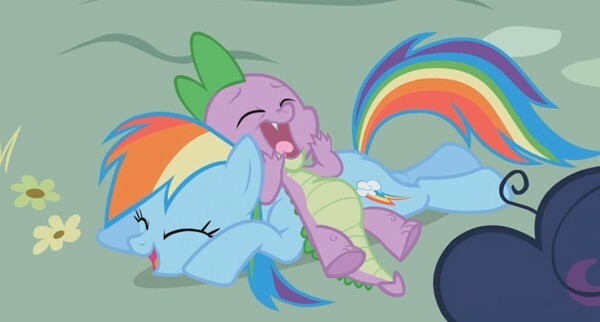 Regardless, this simply doesn't seem like my kind of show and I don't really understand the whole "brony" thing. In the end of the day it's still a show for kids. While Batman: The Animated Series was clearly aimed at both kids AND adults, this show was clearly made for children. I also find the show fun. Charming chracters, catchy music, a lot of comedic moments. Either in story or refencing something that's works well in the story of the episode. There are some great nods to other shows and movies sprinkled in there! John de Lancie voices a very Q like villian in season 2. There are Big Lebowski ponies in the background in a season 2 episode during a bowling scene. There's even Metal Gear references in another.